Made in Japan by Hakoya, this travel chopstick set comes complete with a small wooden pair of chopsticks along with a decorative chopstick carrying case. The wooden chopsticks are shorter than standard size chopsticks and are perfect for carrying around in your purse or suitcase. To make slippery foods like noodles easier to grab hold of, the bottom tip of the chopsticks have a grainy sandy texture perfect for those foods. The case comes with three pieces, the black bottom half, the decorative cover, and a small red fabric band to hold them together. The decorative cover itself is especially made from cherry blossom fabric which has been laminated. 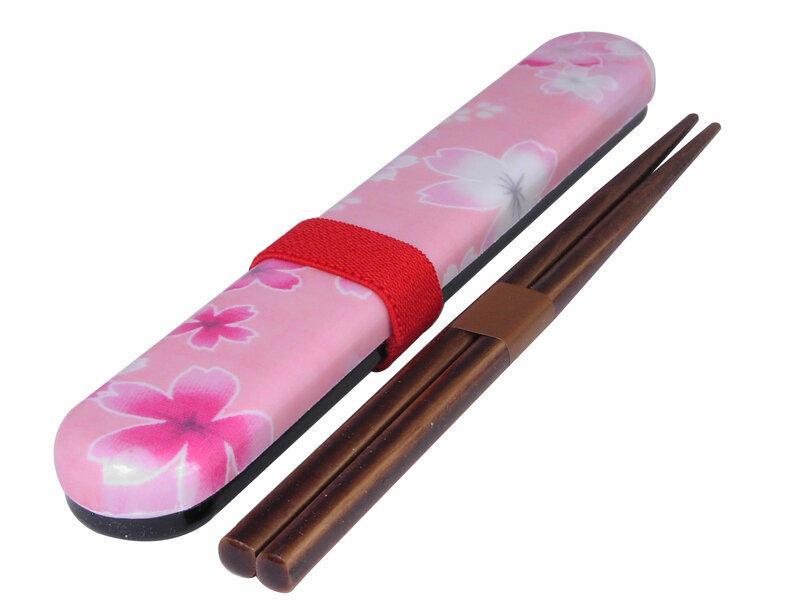 Perfect for those who love to eat Asian foods and prefer using their own chopsticks, or even an adorable set for a child to begin learning how to use chopsticks, this cherry blossom travel chopstick set will make a great gift. Pair up with a chopstick rest like the glass cherry blossom chopstick rest, to really complete the set. Please note that hand washing is recommended for this item.